Police arrest a tree campaigner in Sheffield earlier this month. Sheffield's bitter row over tree-felling has seen it left out of a prestigious list of the country’s most desirable places to live. The city, where protests have been held over the loss of trees, has this year not been included in the The Sunday Times Best Places to Live list. Sheffield Council and its contractor Amey have faced calls to cease tree felling after heated scenes and arrests. Paul Selby, of action group Save Nether Edge Trees, said he was surprised Sheffield was left off the list for that reason. 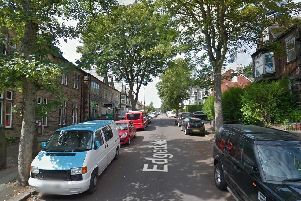 But he added: “There are some streets that were genuinely leafy where 100 per cent of the trees have gone. A Sheffield Council spokesman said: “Sheffield remains the greenest city in Europe and there will be more trees at the end of this programme than when it started, so it is regrettable that the increasingly extreme actions of a small number of protestors is having this impact in the media. “It is also clear that, as the Chamber of Commerce have recently stated, businesses are seeing the inward investment gains from the improvement in the city’s highways”. Bradford was also highlighted as showing ‘no sign of gentrifying’, but York was named best place to live. Jobs, schools, broadband speed and shopping are all taken into account.